Before diving in to this week’s race — one that aims to teach a few lessons about finding live longshots — I wanted to share a secret with you. It’s not about picking winners, or finding value, or how to structure tickets. But rather, it’s something I discovered that could lead me to do each of those things more effectively. It’s possible to save money while learning how to become a better horseplayer. Ease the pain. No more “learning the hard way.” And you don’t have to lose a dime. I mentioned in my first article for Horse Racing Nation that if you want to be successful at this game, you must be different. How much different does it get than playing a game based upon gambling by not betting? I don’t mean all the time — just most of the time, at least in the beginning. The opportunity to receive an amazing education, free of charge, isn’t something many would have to ponder for long. Does this mean there is no work to be done? Of course not. There will be years of study, long hours spent reading, calculating, memorizing and plenty of sleepless nights ahead. The only exception is, you will be saving tens of thousands of dollars along the way. Why should your education at the track be any different? Why continue to learn the hard way? At least at the track, the choice is yours. Yes, there are wins you will pass up. But most of us have lost more than we’ve won during our formative years as horseplayers. After years of making the same mistakes, heck, many still lose regularly. Most us believe we’re better at this game than we really are. The longer we play, the more difficult it becomes to recognize our own bad habits. In the beginning of your journey, if there is a race you feel extremely confident about, certainly play it. But for all the other races in which you aren’t, opt out, watch and learn. It brings you one step closer to your goal of becoming a better handicapper. Consider that your mental win — your tuition payment. Once you’ve progressed and begin to bet more often, you will have built a lasting confidence and learned one of the most important lessons along the way: discipline. There are concerns other than financial to implement restraint in betting early on. During your journey, the answers to a couple of key questions will become apparent. First, how much do you love handicapping? I’m talking about the process — pouring over past performances for hours to solve a puzzle. All horse races are unique, and there is never one exactly like another. They require time and effort to decipher. If this seems like a chore, the problem may be your approach. You may need another method that makes the process clearer and more concise. Second, how driven are you to be successful at it? You will need to invest in some self reflection to figure out your motivations. There is no right answer — just your answer. Are you the type of player who wants to learn the game because you love every aspect of it? Is it your wish to make a lot of money doing a minimum amount of work? Is it a hobby with your friends — a shared camaraderie? Or do you just feed off the excitement and chalk up your losses as entertainment dollars spent? When you take time to reflect on these questions, you can then decide if you’d like an experience with a free ride or a payment plan you may never settle. There are more than just monetary rewards to all of us who love horse racing. No matter your incentive, the more you win, both in your pocket and in your mental column, the longer you can continue to learn and play. If keeping your bankroll in the black is your goal, the secret is to only bet consistently once you’ve learned the game. The anticipation and buildup during the months preceding the first Saturday in May is an annual ritual for horseplayers. With the close of the NFL season, our attention shifts to all things Kentucky Derby. We crunch numbers, we watch workouts, we chat with fellow horseplayers, and we load our fantasy stables with our favorite 3-year-old colts. It’s prep season! Over the course of the prep season, horses either become contenders, they require more time to develop, or they prove better suited for distances other than what is required for Triple Crown contention. A well-known consequence of the points system established beginning with the 2013 Derby has been the elimination of “cheap” speed. While those horses rarely garner enough points under the current system to make the Derby field, they still make appearances throughout the prep races, which can create havoc and provide valuable insights to how the true contenders will react under pressure. Often, their presence also creates value by affecting the shape of prep race. Just over a week ago in the Holy Bull Stakes (G2), not only did Kenny McPeek-trained Harvey Wallbanger upset at 29-1, but Everfast, from Dale Romans’ barn, ran second at 129-1. That's a $1,101.70 exacta returned on a $1 bet! Was there something we missed? Can we identify it and improve our handicapping for the next similar opportunity? I went into the Holy Bull uncertain of the favorite, Maximus Mischief. He was putting up fast works and looked the part, but I was skeptical because he got away with setting soft fractions in the Remsen (G2) and had yet to be tested. Until I knew more, I decided to watch rather than play. In fact, I play very little during prep season, preferring to collect information for the Derby. As I went back and looked at the past performances, however, I noticed something interesting. Just as two longshots finished in the top two spots, the race contained two of my favorite handicapping angles: improved turn-time and recent works that are faster than the same distance in recent races. These are attractive to me because they are factors not always apparent to the general public. Included are the past performances so you can re-evaluate the race yourself before moving forward. Let’s look at Harvey Wallbanger first considering he was our winner. First time out of the gate in Saratoga, he finished second in a six-furlong sprint to the Chad Brown runner, Complexity, the eventual winner of the Champagne (G1). He then stretched out to 8.5 furlongs and faced off against Plus Que Parfait at Keeneland, finishing second again, this time by a nose. Churchill Downs was the next stop, where he remained at 8.5 furlongs in a maiden race and played second fiddle once more. What we can extract from all of these second-place finishes is that Harvey Wallbanger had been running well against some highly regarded colts. On Nov. 17, he finally broke his maiden at Churchill Downs over the same 8.5 furlong distance. 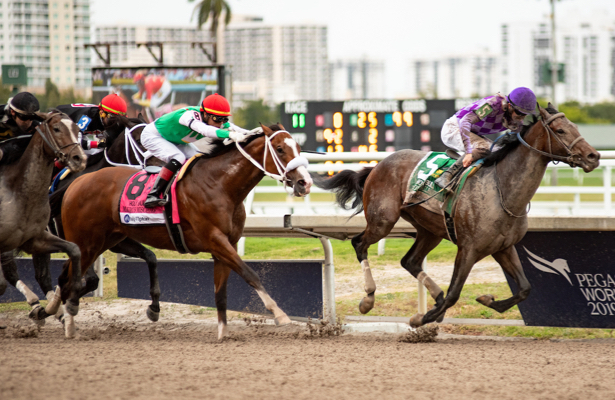 The 2019 edition of the Holy Bull is yet another example of taking the time to look past the speed figures, and as discussed earlier, especially at a stage in a horse’s development when he’s eligible for improvement in leaps and bounds. If you dismissed him on recent speed figures alone, you missed out. Harvey Wallbanger’s bullet work on Jan. 17 at Gulfstream Park drew the attention of many handicappers, as he ran fastest of 32 times posted that day. What caught my eye was that he ran faster going a half mile than in any of his last three races. Simply, Harvey Wallbanger was training faster than he had been racing. That’s an obvious sign of improvement. Another item of note was how Harvey Wallbanger ran while breaking his maiden. Although it was not suitable for his running style, he was able to close into the leaders of a soft pace. Perhaps another clue? Determining whether this horse had a real chance to win, however, would depend on the conditions of this race such as the race shape and the level of his competition and their form cycles. Let’s move on and look at Everfast, a son of Take Charge Indy who just edged out Maximus Mischief at the wire to take second. At 129-1, how could this happen? How could everyone be so wrong about this horse’s chances? An often-overlooked factor in handicapping may have pointed us toward this huge longshot hitting the board: turn time. In my last article, I discussed identifying factors either not in the past performances, or factors lurking below the surface stats of the past performances. Remember, using information that the general public regularly overlooks can be a huge advantage. When I examined the turn time of Everfast over his last few races, I may have found a diamond in the rough. Turn time is the difference between the first call and second call of a race and is often referred to as the “hidden fraction.” This fraction is a great measure of a horse’s true ability and certainly worth additional reading — check out Modern Pace Handicapping by Tom Brohamer — if the concept is new to you. In the case of Everfast, I was looking at the differences between the four-furlong and six-furlong times because we were dealing with route races. On Oct. 28, Everfast ran in an 8.5-furlong allowance optional claiming race at Churchill Downs. He was head and head with another horse through the second call, with fractions of 233, 474, and 1132. The approximate turn time for Everfast that day was 253, or 51.64 feet per second. He raced again on Nov. 24 in the Kentucky Jockey Club Stakes (G2). Considering it was run on a sloppy track and Everfast was never really in contention, I drew a line through it. On Jan. 18, he returned in another optional claiming race, this time at Gulfstream Park, where he again showed early speed. But in this race, he displayed a turn time of 242 , or 54.30 feet per second. In both races, Everfast ran consistently to the first Call (55.49 feet per second and 55.21 feet per second), but he showed improvement in turn-time in the January race compared to October (253 to 242). That is a significant jump and another good indicator of an improving horse in good form. These are just a couple things that stood out to me. What about you? Were you fortunate enough to identify Harvey Wallbanger or Everfast as potential winners in the Holy Bull? What did you see in the past performances that informed your decision? Let’s hear about it in the comments. The Monday Morning Handicapper is always learning. Scott Calabrese has lived in Houston, Texas, for the past 15 years and has followed the races since childhood growing up in New Jersey. Also catch him on Twitter: @TooClose2Call.